European Union And The Deconstruction Of The Rhineland Frontier: 9780521880848 Hardcover - LIMEROCK BOOKS INC. The Rhineland region includes the core regional economy of western Europe, encompassing Belgium, Luxemburg and parts of the Netherlands, France, Switzerland and Germany. Throughout history there have been tensions between this region's roles as a frontier and as western Europe's economic core. Michael Loriaux argues that the European Union arose from efforts to deconstruct this frontier. He traces Rhineland geopolitics back to its first emergence, restoring frontier deconstruction to the forefront of discussion about the EU. He recounts how place names were manipulated to legitimate political power and shows how this manipulation generated the geopolitics that the EU now tries to undo. Loriaux also argues that the importance of this issue has significantly affected the nature of the EU's development and helps condition a festering legitimation crisis. 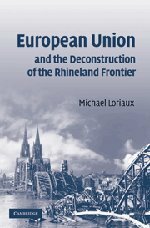 In an original study of the history and politics of the Rhineland region, Michael Loriaux argues that the European Union is about frontier deconstruction, but that deconstruction has stopped half-way. While political frontiers have been deconstructed, cultural separators are still in place and compromise the development of the European Union.